Decorated Cannon Beetles (ミヤビフタクチ?, lit. : "Elegant Top-Mouth") are enemies in Pikmin 2. They have an appearance similar to Armored Cannon Beetle Larvae, but are red instead of green, and have orange eyes. Also, this particular species is never found buried in the ground like Armored Cannon Beetle Larvae. They, too, spit out stones, but their rocks home in on the currently active leader due to the magnetic field which envelops the boulders. However, the stones have odd characteristics. First of all, when they are found in caves which are made of metal (which is rusty, indicating it contains iron), the spacesuits are the only thing the boulders home in on. The rocks are also surprisingly frail, in that one can be destroyed by throwing a Purple Pikmin. Much like the Armored Cannon Beetle Larva, Decorated Cannon Beetles will wander aimlessly in a small area while left alone. Unlike their green counterparts, they will never be found buried in the ground. When approached, the larva will spit a large rock that crushes Pikmin, killing them instantly. These boulders move slowly compared to those shot by the Armored Cannon Beetle Larva, but they home in on nearby leaders. The rocks can be destroyed if they are lead into a wall, another enemy, and the impact of a purple Pikmin is even enough to break one. If the rock collides with another creature, it will deal a large amount of damage to them, enough to kill most small enemies. Certain creatures, however, are protected from the damage, such as Anode Beetles. When attacked, the Decorated Cannon Beetle has only one defense: a bucking motion that will send all attacking Pikmin flying out in front of it, briefly incapacitating them and possibly deflowering them, and knock any nearby leader to the ground. This is very similar to defensive attack of the Fiery and Watery Blowhogs. The best way to defeat a Beetle is to use its own boulders against itself: since the rocks follow the leader, they can be manipulated into hitting the same Beetle that shot them. However, it is impossible to get a rock out of most lower water-filled areas. As a note, the rocks it shoots cannot be petrified, but they will not hurt the leader if he lies down. The boulders also act quite well against other enemies as well, killing small ones instantly and larger ones in one or two hits. Damage is determined by the speed of the stone and where the enemy is hit: hitting an enemy in the head will do more damage. If there is not enough room to do this, you should resort to using purple Pikmin to stun and quickly defeat the creature. Take a small group with you to avoid large amounts of death from the boulders. If the creature does get a chance to spit a rock, guide your Pikmin such that they are always on the opposite side of the leader that the boulder is approaching from, and lure it towards a nearby wall. For information on the rocks it spits, see Armored Cannon Larva technical information. This creature's name differs from the Armored Cannon Beetle Larva's with the word "Decorated", which refers to its shiny red body. 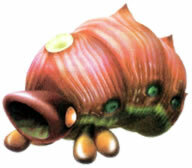 For reasons unknown, the word "Larva" is absent from its name when compared to the Armored Cannon Beetle Larva, despite it being a cannon beetle larva as well (although the word "Beetle" was dropped for Pikmin 3). In Japan, the enemy is called ミヤビフタクチ?, which translates to "Elegant Top-Mouth", similar to the Armored Cannon Beetle's Japanese name. Its scientific name is Granitus decorum; Granitus is the genus name for the lithopod family, decorum is Latin for "decorated". Internally, this enemy is called rkabuto, which is the same as the Armored Cannon Beetle Larva's name, but starting with "r", for "red". In the GameCube Interactive Multi-Game Demo Disc Version 18, this beast's scientific name gains chukkulinae as the species name, and the usual decorum name is moved to subspecies, making its early scientific name Granitus chukkulinae decorum. A Decorated Cannon Beetle in the Piklopedia. A Decorated Cannon Beetle spitting out a rock. A Decorated Cannon Beetle petrified. A Decorated Cannon Beetle shaking itself. A Decorated Cannon Beetle's corpse. The creature's e-card, #66 (5th red card). On the Piklopedia, this enemy cannot be destroyed with its own projectile. If pikpik carrots are thrown such that the Beetle's rock chases after them, curves, and hits its launcher, it will break without damaging the beast. In the end of day sequence at the Valley of Repose, a Decorated Cannon Beetle often appears. Sometimes it will shoot rocks (which occasionally strike and injure/kill other enemies), inhale, and walk much faster than normal. If the game is paused just as the creature makes its first dying sound, some strange noises will be heard, that get lower and lower, lasting for more than 10 seconds. The same will happen with an Armored Cannon Beetle Larva. The Decorated Cannon Beetle's boulders act much like the red shells from the Mario Kart series, in that both home in on targets. In addition, both the creature and shells share the same red coloration. This same similarity applies to the Armored Cannon Beetle Larva and green shells. This page was last edited on March 15, 2019, at 17:08.